Ok I am going to start taking the story chapters that were in the Original RP thread and placed them here instead to allow better reading for those who wish to read the story that we have been developing. There are several rules here. 2) If you would like to join please feel free! Create your own character and develop them with interaction amongst the other characters. This story is made with several authors so there really isnt a "Wrong" way of writing. Umm Mrs. Takamachi, I was ordered to report to you imeadiatly after my debriefing and tell you that I was to be stationed under you and... *looks at paper again* a Mrs. Fate T. H. Takamachi I think? So uh. *saluts* Captain Nicholas Reo reporting for duty mams! Ahhh, Yes i heard about you from Hayate-Chan. It's nice to meet you, i hope we can get to know each other. So Reo-san *Smiles politly* What exactly are you plans for the future, and why did you pick Section 6? Have you spoken with Fate-Chan yet? I don't realy have any plans mam, I was pulled off the front after being there for the lest three months. I have heard about section 6 AND about all the hard work you and Cpt. T. H. Takamachi have done. I mean, you guys are considered legends where I'm from! I guess my plans are to do more good to help lessen the amount of enemy forces on the front so our boys down there don't get to bad. I have a lot of good friends down there, ye know. Nyahaha *scratches cheek* i wouldnt say legends, but i'm glad YOU've heard of us. Good, we can always use more recruits and i'm glad you feel like you can help people. If you want i'll teach ya' myself, you can woke with my forwards too. Yes we need to protect as mush as possible, i also have some good friends down there. *Smiles* i think your going to fit perfectly here! "Something's not right... I feel some sort of powerful energy coming from this strange new recruit... what is it...?" "The truth is: I am madly, truly, deeply, passionately in love with you." Ah Fate-Chan let me introduce you. *takes Fate's hand* This here is Nicholas Reo, and he's our new recruit, say hi. Starting today he will be working for section 6, under you and I. Looking at Fate nervously, Reo tried to talk to Cpt. Fate as best as he could. For some reason he didn't like the look in her eye. "I have orders directly from Commander Yagami herself to follow any orders given to me by you or Captain Takamchi here, ma'am! *Grips Nanoha's hand protectively* I see. So it IS him they were talking about. My name is Fate T. Haralown, it's a pleasure to be having a new recruit on our side. ^^ *Pulls on Nanoha's hand* We have to go now Nanoha, it's an emergency Hayate says. It was nice meeting you Nicholas Reo. We will see you tomorrow in the morning. "I guess I'm being waaaay too overprotective... *Blushes*"
"I can't tell her I'm being overprotective over her again... she'll look up at me with those puppy eyes of hers and tell me that I don't need to worry about her... which I still always do, not matter what. *Sigh*"
"Well yesterday was a bit weird, well at least I met my captains which I guess puts me off at a good start, right? I wonder who else I'll be working with here and I wonder if they'll be as nice as Mrs. Takamachi. So far everything seems so nice here, I mean it sure is a lot more peaceful, the bed was nice to." "A lot more quiter to, god I hated waking up to the sound of shells in the morning." *Wakes up and looks over at Fate* *Quitly gets out of bed, and goes to the bathroom* I should let her sleep in, yesturday was a long day for everyone. I hope today will be easier. *turns back to face the sleeping Fate* She looks so cute sleeping. I don't know why, but i have an odd feeling like somethings going to happen today. After wandering around for the past hour and 43 minutes, Reo finds himself horribly, horribly lost. "Where in the name of Dia on high am I!" *Feels a breeze come from the open air, blanket half off and half on* Mmm~ Nanoha... why is it so cold...? 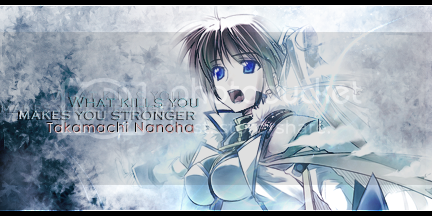 *Shivers* *Reaches out and tries to find Nanoha* *Grunts* *Opens one eye slowly* Nanoha...? *Blinks blinks* where are... you...? *Sees Nanoha's side ponytail popping out from the stairs, fastly but silently putting her blue and white shoe on* Nanoha? Sorry did i wake you? *Stands up, shoes on* *smiles, scratching cheek* I wanted you to sleep in today, guess that didn't work did it? Yes! I can spend the whole day with her today. *Smile widens* You dont even have to ask, help out when ever you want to. Meanwhile still somewhere on the grounds of section 6, Reo is still terribly lost. "Great now I think I'm even more lost than I was before. Wait, thare's another person, maybe he could help me out. Excuse me, Lieutenant! Can you tell me whare I am? No. Well that's just great. Well good luck to you too then buddy." Walks off again trying to find his destination. *Frowns as Fate got a call too* I wonder what happened? Raising Heart put it through. Something's not right... Hayate rarely gets worried... I wonder what happened... is it the new recruit...? *Smiles weakly at hayate* Um..Hayate-Chan? *one more looke at Fate, Hayate's disappears* *Looks at Fate's worried look, before taking her hand, squeezing it* we should go...? The both of us walked out of our room and kind of paced our way to Hayate's office. When we stood in front of her office, we felt the intense tension around her office. We looked at each other and gulped before hearing Hayate telling us to enter. The door screeched opened and we stood there, looking at her sitting behind her desk with her hand intertwined in front of her, with a nervous look on her face. "I'm afraid we have bad news..." Hayate started. "You two won't like it a bit..."
Hayate-Chan...What...what are you talking about? I'm sorry I didn't realize this in time, *Hayate said, something both of them didn't know in her eyes* But this invloves all of us now. We need to stick together. I heard Nanoha gasp, but didn't look at her... she knew... I knew... even Hayate knew... something was up... and whatever we were up against... it wasn't good at all. We didn't care much about what was happening about the environment, we cared more about the three people in the picture. "I... I'm sorry..." Hayate began, turning around. "By the time I woke up Vivio was already... gone... I think someone from the inside had something to do with it... I was drugged from behind, I thought it was you or Nanoha coming... but I guess not... I'm sorry, I should've been paying attention..."
Everyone was quiet. The room was in silence now. The three of us knew what each of us were thinking, we didn't need to talk, there were no need for words between the three of us. *looks up at Fate, tears in eyes* Why...? Why!? Why is this happening?! "Thanks sergeant, I owe ye one for this now mate. If ya evar need anythin' in return just give me a call alright." "Ah it was nothing Captain, I'd do it anytime, but hey, if ye can tell my brother I said high it would be a very nice thing of you to do sir." "I will if I get a chance, and thanks agin mate." Taking off down the hall again Reo was walking with a little bit of a spring in his step and the begings of an old childhood tune in his head and heart. Finally he was able to bump into an enlisted man who wasn't just scared of him because he was an officer, but he was able to bump into an enlisted man who could actually give him directions none the less made him the happiest man on Mid-Childa at the moment. It made it even better that he was a brother to a friend of his out on the front. Now armed with the knowledge of where he was going, he was just about to round a corner that would lead to his buildings steps when he bumped into his captain, Takamachi Nanoha. From what he saw, she had aparently been running blindly down the hall with tears in her eyes in what could have been an instance of, well, he didn't know. But he knew something was wrong for her to be running like this. After catching himself from the force of Nanoha's body barreling into his, he made sure Nanoha would keep her footing before he asked, "Mornin' Mrs. Takamachi, what's wrong ma'am, if I may ask?" "Vi-vi...V-Viv..." After muttering what sounded like Viv to Reo's ears, she pushed him out of her way as hard as she could and began running off again. Looking in the direction she ran off to, he couldn't help feel a little bit saddened that someone as nice as her should be feeling so saddened right now. For some reason it just seemed to break his heart in two. "Well, I hope she's alright, she's too nice of a lady tah be in a state of mood such as that," He muttered before turning back to the hall he was going to walk down.